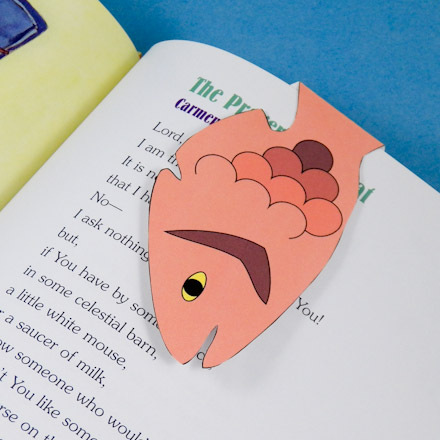 In this project, make animal-shaped bookmarks from cardstock. Just print, color, cut and bend to make these cute bookmarks for yourself or to give as gifts. This is a good project for kids to practice coloring and cutting. It is also a quick craft for adults to make as gifts for the kids and grandkids! Related crafts: Upcycle drawings and other art to make Artwork Bookmarks, or turn leftover craft paper into Punched Bookmarks. Choose the bookmarks you want to make. 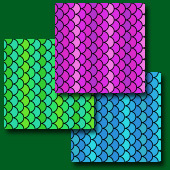 Download and print the pattern onto white cardstock. 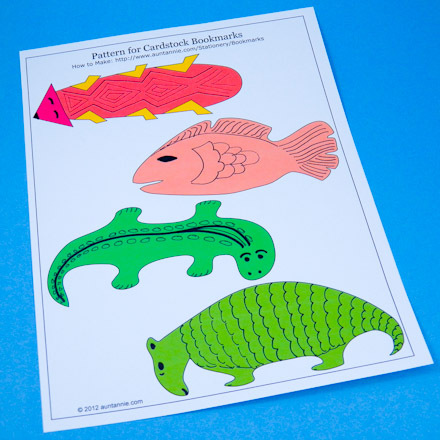 For a full set of animal bookmarks, print the Fish and Armadillo, Bug and Lizard, Seahorse and Shark and the Silly Worm patterns. Some of the animal bookmarks are easier to cut. They are grouped together on the Easier to Cut pattern. For the most creativity, select the Blank Bookmarks patterns and draw your own designs on the bookmarks. 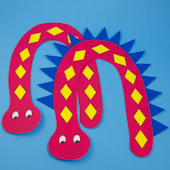 Tip: Practice your cutting skills with the Silly Worm bookmarks. Choose to cut smooth curves or pointy tips. Tip: The black & white patterns can be printed on colored cardstock or white cardstock. If you printed a black & white pattern on white cardstock, color the bookmarks with colored markers or colored pencils. Don't use crayons, as they might rub off on the book pages. Cut out the bookmarks on the black outlines. Turn the cardstock into your scissors as you cut to create smooth edges. Your can stop here for a flat bookmark. Go on to the next step to make a bookmark that folds over the book's pages. Tip: Adults may need to help smaller children with cutting small details. 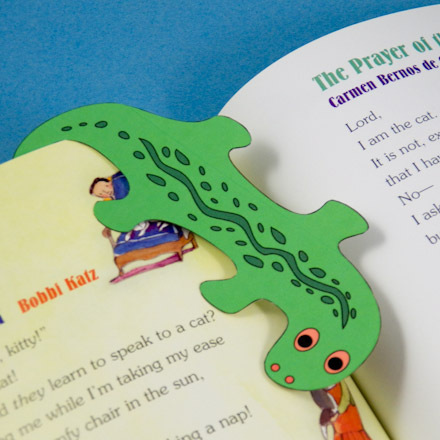 Print the Easier to Cut pattern for bookmarks with fewer sharp corners and small curves. 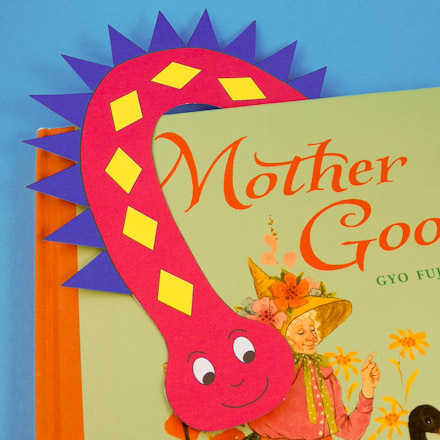 For a bookmark that folds over the top of the book's pages, the bookmark needs to be bent back about 1" from the top. Lay a ruler across the tail of the animal, about 1" from the end. Use the back edge of a pair of scissors or an empty ball point pen to score the bookmark. Hold the ruler with one hand and run the scissors or empty ball point pen down the edge of the ruler. Bend the bookmark back on the scored line. When placing this type of bookmark in a book, put the folded top edge behind a few pages. That's it. Your bookmarks are done! Tip: The Animal Scales digital papers come in Blue, Green and Pink, and add a nice touch when printed on the backs of the Cardstock Animal Bookmarks. 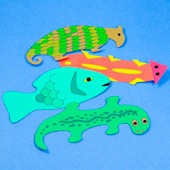 You can also use the digital papers for any animal craft requiring scales—fish, lizards, snakes, armadillos. 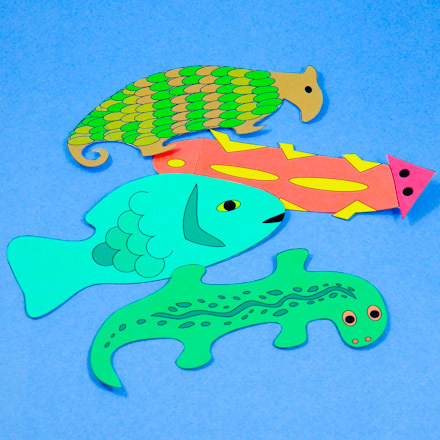 Tip: Stop after Step 3 to make flat animal bookmarks. 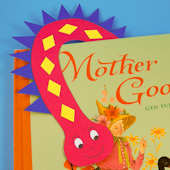 Or go on to Step 4 to make bookmarks where the tail bends back over the book's pages. Tip: For the most creativity print the Blank Bookmarks pattern. The colored blank bookmarks can be decorated with black felt-tip markers, thick and thin. Use colored markers or pencils to decorate the blank black & white bookmarks. Tip: Make the Silly Worm bookmarks to practice cutting skills. Aren't they cute? Thanks to Janet LaFara for creating the original Cardstock Bookmarks project and patterns for Aunt Annie's Craft Page in 1997.